They have had considerable success in all sections of the Pembrokeshire One Act Festival competition. They have represented Pembrokeshire on many occasions in the Welsh finals. They are a highly dedicated society, with a strong youth section (particulary for their pantomimes). They produce a wide variety of drama throughout the year at the Tabernacle Hall in Milford Haven, as well as other venues. 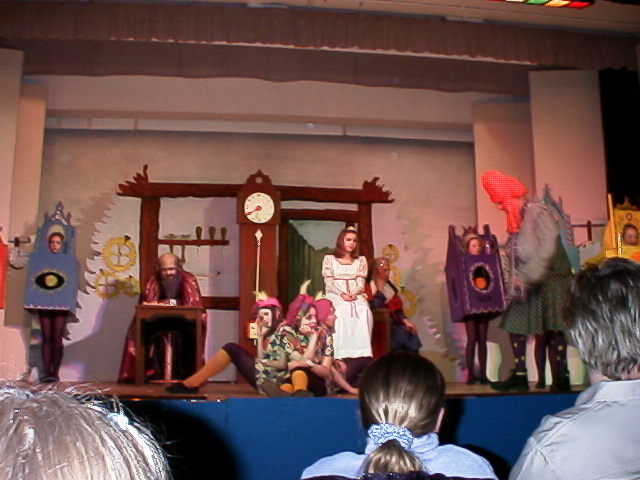 The New Tabernacle Players have changed the format for their autumn production in 2001 by performing two One Act Plays instead of the usual Three Act. The first play is the very funny 'Don't Tell Me, I'll Tell You' by George H Cummings. The second play is 'Cliff's Edge' by Paul Beard and is a black comedy. The plays take place as usual at The Tabernacle Hall, Milford Haven on 4th, 5th, and 6th October at 7.30. If you are a member of this society, please send us some more information so that we can include more about you in our site. Such things as forthcoming productions, past productions, society ethos, whos who, web-site, e-mail contact etc etc. A representative from PEMBSAMTH had the pleasure of a visit to see the two One Act Plays that The New Tabernacle Player had presented on October 4th, 5th and 6th 2001. The first of the two plays was the more farcical (Dont Tell Me, Ill Tell You), and revolved around the goings of people queuing for a bus. Directed by Anne Trew, it had some delightful performances particularly from Sarah Colquhoun (as Wife) who played a neurotic middle-classed lady with her husband (played by Phil Shrubbs) who eventually gets so fed up of queuing, and the conversation of Mrs Docherty (played delightfully by Mavis Hills) that she has a mini-breakdown and has to leave the queue to walk back home. Mavis Hills performance was polished, and Malapropism ridden, which added to the comedy value of the play. Nigel Cawdron played a Philosopher who tries to ignore the irritating Mrs Docherty. Ian Sherwood played an actor who arrives to join the queue in an amusingly over-the-top thespian manner. Jayne Hill, Joanna Smith and Andrew Rees also added to the overall quality of this production. 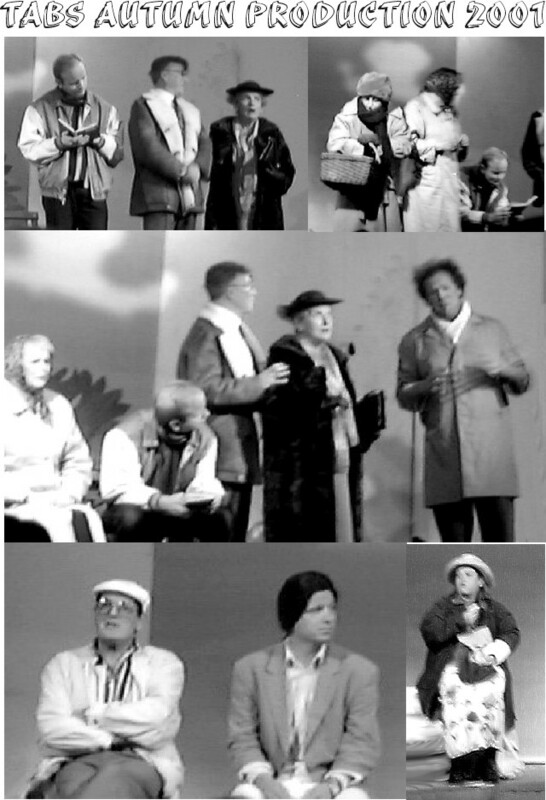 The second play, Cliffs Edge, was more of a black comedy, and had 3 characters Cliff, Gary and Sue played by Jim Roberts, Nigel Cawdron and Jayne Hill. It was the directorial debut of Sue Williams (who must be commended on her first attempt at directing). Gary enter the scene (Beachy Head cliff top) in a glum mood and is contemplating suicide, he is an actor whose only moment of fame was to have appeared in Crossroad many years ago! Cliff, who runs the Beachy Head public house with his wife, enters and tries to persuade Gary not to end his life. Cliff recognises Gary from his time in Crossroad and is offered an autograph. Cliff is a regular visitor to the cliff top, as he regularly tries to persuade other suicide cases not to jump. His success rate isnt particularly good though! As Cliff exits, Sue enters. She is also contemplating suicide, and she is manically depressed. She also tries to stop Gary from ending his life by many tactical forms of persuasion. She thinks she has been successful when Gary exits up stage, but unfortunately she hears Gary cries as he leaps from another part of the coastal path. Cliff enters to discuss with Sue Garys demise. Sue exits to Jump off the cliff top, soon to be followed by Cliff who is fed up with his wifes affair with the Pickled Egg salesman! but unfortunately, as Cliff run to the edge of the cliff he forgets the name of the famous Indian chief that the other had shouted when they had jumped from the cliff! All actors performed their parts particularly well, especially Jim Roberts who is perhaps the best find in amateur dramatics that Pembrokeshire has had in many years. It is no wonder that many of The New Tabernacle Players are often asked to perform in many other societies productions. particularly Xenon Liberal Arts.